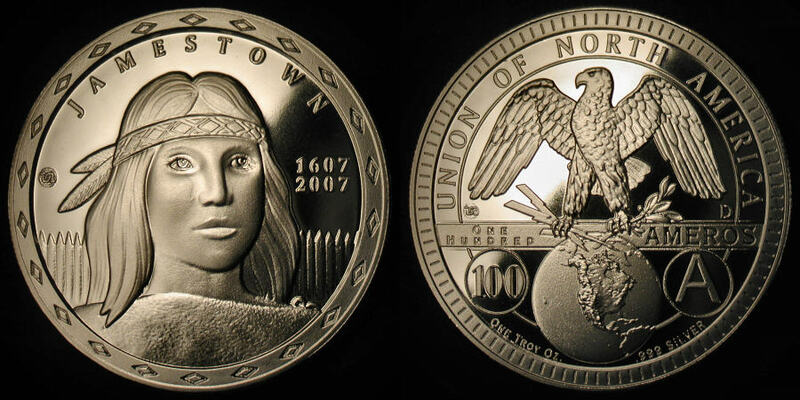 Jamestown Pocahontas 400th Anniversary commemorative. The tragic life of Pocahontas is shown as a beautiful spirit in a harsh world, the reality of which is symbolized by the stark Jamestown fortress wall. Twenty-Two diamonds around the rim count the number of years in the short life of Pocahontas. The image shows a rendering of the proposed design. This is a pre-sale item (currently discounted), with expected delivery by early October, 2007.